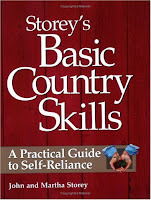 Storey's Basic Country Skills. A Practical Guide to Self-Reliance. Highly Recommended. As I noted in this post, self-sufficiency may become increasingly necessary in the future. In that same post, I reviewed a very good primer on self-sufficiency. This one, dear reader, gives it a run for its money. The book is divided into four simple categories: home, garden/orchard, cooking/preserving, and your barn/stable/fields. Each section has a wide range of skills that it describes in fairly extensive detail. Since one person cannot possibly be an expert on every single discipline that is examined, the author has compiled excerpts from other books and articles from authors who are experts. I feel that this gives the book even more utility, since if you find a section interesting, you can head down to your local library and have a name of a useful resource at your fingertips. There are literally hundreds of sources for this book. I noticed that several sections were drawn from books that I have already featured, Dirt Cheap Gardening, for instance. This section, as you may have surmised, deals with your homestead. First selecting a good site, and then improving and maintaining it. There are many home improvement skills covered (which probably should only be used as a starting point). It also covers water, plumbing, electricity, and other utilities. This is the most extensive section of the book. There are tips to improve your ability to grow just about any type of plant; from vegetables to flowers to your lawn. Both pests and beneficial animals are highlighted in separate sections. Greenhouses, sheds and other structures are illustrated; and rock and water gardens are given a small treatment, as well. This section has many recipes and techniques to preserve food and create new taste sensations. Even cheese and yogurt recipes are included (which I most likely will not be attempting). There are sections for butchering and preserving meat, but once again, I will most likely not be trying. It seems like butchering animals might be something you learn from somewhere other than a book. What could possibly go wrong? Care of farm animals of all types are highlighted here; such as cows, swine, goats and rabbits. Even country pets - the outdoor dog and cat - are examined. There is also an extensive section on small scale farming which I found to be quite interesting. High value, labor intensive crops are suggested; pumpkins, bees, Christmas trees and many other cash crops are covered in detail. There are also chapters for farm structures, tools and implements. As I have said before, there is no complete self-sufficiency guide. However, this book has a very wide range of subjects and is the best overall self-sufficiency book I have reviewed to date. It has applications for nearly anyone; from an apartment dwelling urbanite, to the most rugged independent homesteader. I recommend it for anyone's home library. We should indeed be aiming to be more self reliant in all matters; transport too. Electric vehicles are the way in which reliance on foreign oil can be reduced and if electricity can be sourced from solar panels or wind mills set up at home, you would genuinely be self reliant in matters of personal transport! I agree 'electric car'. I have done some initial research on converting a conventional vehicle into an EV. As the battery technology improves, it may become an option for more and more people. Solar technology must improve as well before mass adoption becomes financially viable. If we can no longer rely on the power companies for electricity, 'The Long Emergency' will no doubt be in full swing.